I’m Mandy. The person who takes care of me, Sue, has entered me in The Humane Society of the United States’ and Humane Society International’s Spay Day Online Pet Photo Contest. Now I need your vote to help me win some cool prizes — and to help me raise critical funds for spaying and neutering to control pet overpopulation. 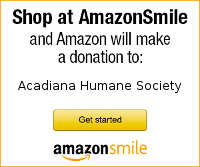 Go here to vote for me by making a small donation to my sponsored charity, which is Acadiana Humane Society! To celebrate the 15th annual Spay Day on February 24, 2009, The Humane Society of the United States and Humane Society International are telling everyone how spaying and neutering improves pets’ lives. In addition to making pets better, more affectionate companions, spaying and neutering helps animals live longer and healthier. To enter the photo contest, my foster Mom submitted this picture and wrote a few nice words about me. The rest is up to you: This is one contest in which you can “buy” votes — and that’s exactly what I’m asking you to do. In this contest, every US $1 you donate in my name both supports spay/neuter and awards me one vote in the contest! If I finish in the top 500, I’ll win some sweet prizes. I’d appreciate your vote and donation today, but if you’d like to enter your own pet in the contest, then please doâ€”I can handle some friendly competition! And if you want to stay on top of how I am doing in the contest, visit the Search Pets page and search for me by name. You can now also find me on Facebook! You can share my entry with your family and friends — on Facebook. Enter your pet in the contest and donate to vote today. You may enter the contest until 5 p.m., Eastern Time, on February 27, 2009; voting ends at midnight, Eastern Time, on March 6, 2009.